Chris Sanchez’ 1949 Citroën 11CV Berline Légère Traction Avant has great lines with plenty of patina. It’s not hard to see why it was a big hit with the French public. One of the Giants of the Early Days of the Automobile was Andre Citroën. Spotlight | Although primarily known as the builder of Citroën cars after World War I, Citroën got his first taste of the automobile industry early in the century. Andre Citroën was a progressive figure and a man who brought many pioneering concepts to French industry and auto manufacture. In many ways Citroën invented the concept of what a modern automobile would be and what an automotive company could be. The company offered financing and insurance for its customers. It also offered daycare, medical and dental care and a gymnasium for his workers. Citroën made toy versions of its cars so that children would be predisposed to the companies’ products when they grew up. The company also made road signs for the French government. The bee logo is the badge for Bourdon Montrouge, one of the largest Citroën dealers in France. A very popular and charming Traction accessory. On a trip abroad as a young man, he came across a system of chevron-shaped double-helical gears. He purchased the patent and put together a company producing gears, Hinstin Freres Citroën et Cie, and employed the latest mass-production methods then being used in the United States. In 1908 Mors, one of the great French pioneer marques, asked Citroën to be head of production, which had been running at the rate of 120 cars a year. Within a few years he had raised output to 1,200 cars per annum by applying the assembly line production methods of Henry Ford. When France entered WW1, Citroën found himself a captain in the artillery. He realized early on that there was a serious shortage of munitions. He was able to convince the army and the government that he could greatly increase production. He built a modern munitions plant employing as many as 14,000 workers. Once again he employed assembly line methods, eventually turning out more than 50,000 shells a day by the end of hostilities. 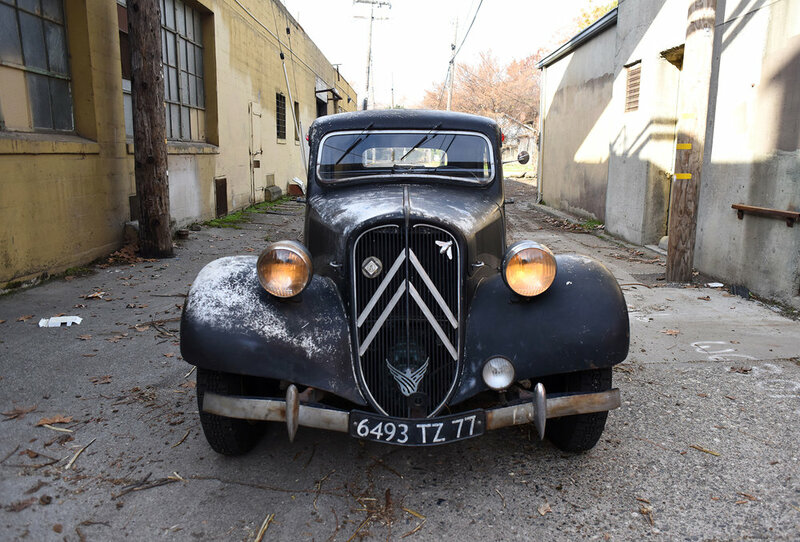 When the war ended, Citroën realized that France needed to get back on its feet financially. He balked at turning his trained work force out. He realized the negative economic impact it would have on not just them but the country. After deliberating on the best course he decided to produce automobiles. But not in the mold of prewar car production where cars were an expensive, mostly handmade, proposition for the upper classes. Following the lead of Ford and Austin, it was clear that what was needed were mass-produced cars that were affordable to the growing middle class. The company logo was to be a chevron shaped like the helical gears made by Citroën’s first company. The first Type A cars rolled off the production line in the new Javel works in 1919. Eventually the company grew to be one of the three largest in France. The company’s fortunes had begun to fade as the depression deepened and Citroën realized that something new and revolutionary was needed. But development of the new car seriously stressed the company, and in 1934 Citroën was forced to declare bankruptcy. Andre Citroën was forced out and the company was taken over by Michelin, which was the the largest creditor. However, development of the front-wheel-drive car continued. Unfortunately, Andre would not live to see its success. A year later in 1935 he died. 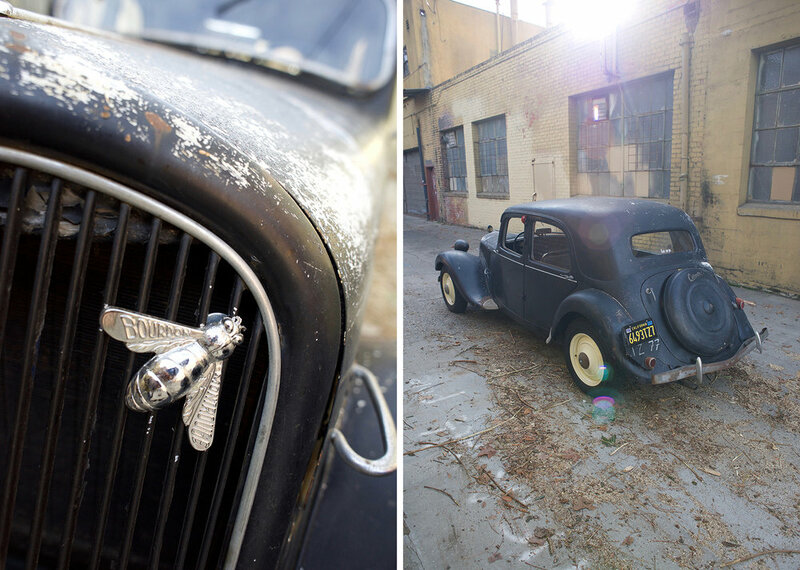 The new car, the 7CV, popularly known as the Traction Avant (front-wheel-drive) became a French cultural icon. The car that almost killed the company turned out to be a smash hit that helped put Citroën back on course for the rest of the century. The chevron logo on the grill is still used by Citroën. 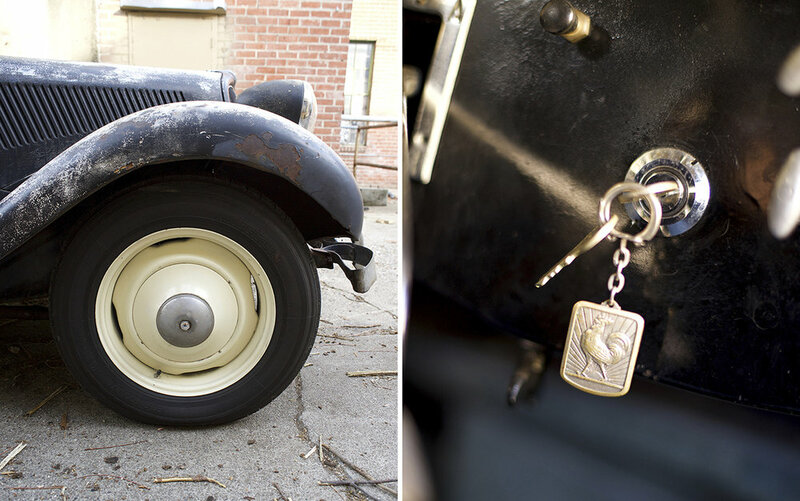 It is attributed to the chevron-shaped gears made by Andre Citroën’s first commercial venture. The Traction became the car for everyone from the bourgeoise to gangsters to movie stars, and even became a character in itself in the movies and popular culture. It was famously used by the French police. During the war it was the car favored by the Gestapo, although it was so loved this was not held against it. It was popular with the middle class, at least those who wanted more than the firm’s other hit, France’s equivalent to the VW bug, the cartoon-like 2CV. 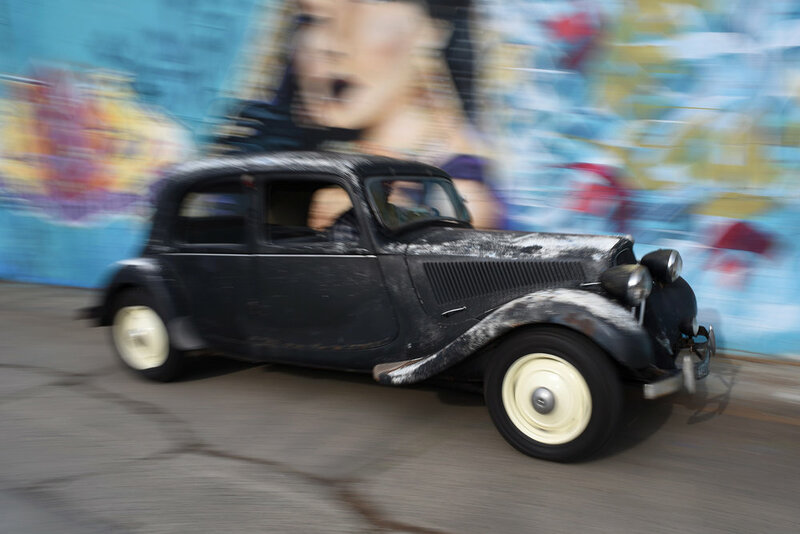 French writer and photographer Roger Grenier in his memoir “A Box Of Photographs,” tells a droll story regarding the Traction: “Before the war, one of the most common cars was a Citroën Traction Avant, invariably black. It was hard to tell them apart. So you’d mark yours by painting, for example, two parallel bars on the door. That’s what the photographer Kitrosser did. Unfortunately he was not alone in this. 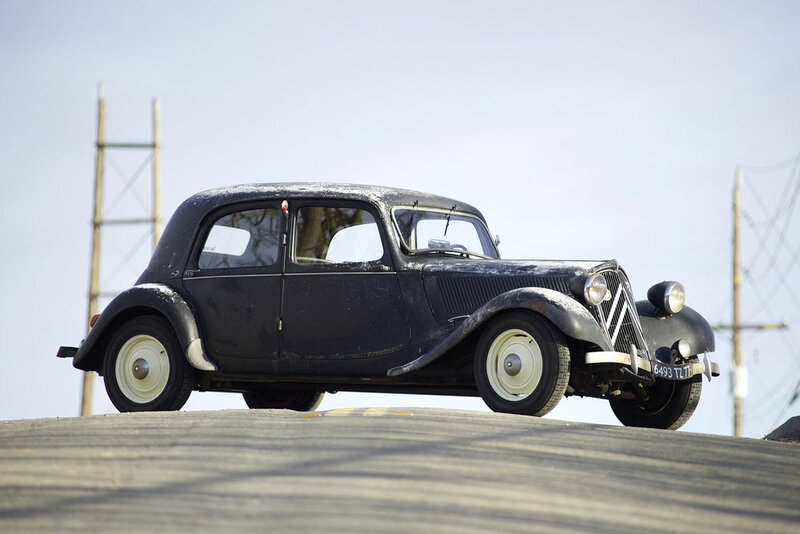 The Traction Avant first appeared with a 32 HP, 1303cc four-cylinder engine. This was soon expanded in subsequent models. 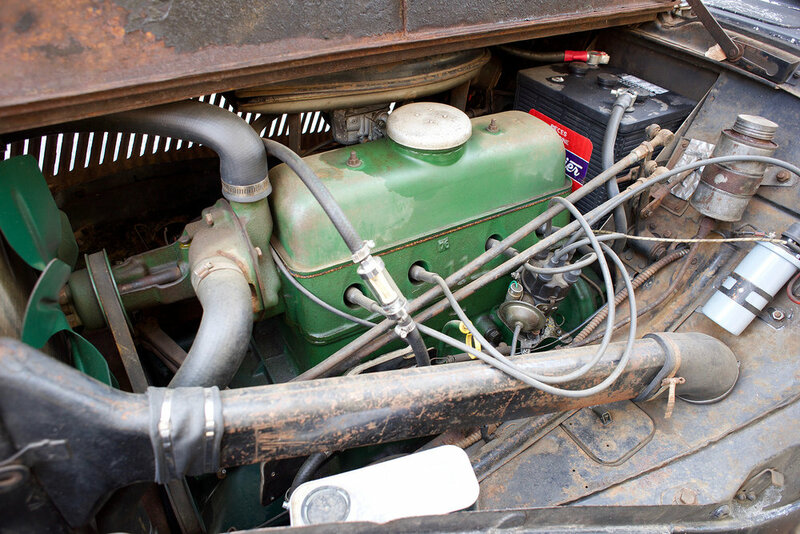 Eventually the 11CV Big Six version was equipped with a 2876cc six. There were several variants of the Traction, including commercial vehicles, pickup trucks, sedans, coupes and cabriolets. The Traction was sold in the United States as the Challenger, which was simply a rebadged Citroën. There were right-hand-drive versions built at Slough in England. Toward the end of its life there were some V-8 prototypes that never saw the light of day. Most vintage French cars feature small engines. Cars were taxed on the CV, or steam horsepower, rating of the engine. This had the effect of keeping engines small. One of the last versions, the 15CV, featured the Hydropneumatic suspension that was famous on the groundbreaking D-series cars. The Traction Avant was a car of the 1930s, but it was advanced for its time. About 20 years ahead of its time. Most cars of the time featured wood-framed bodies on ladder frames with bolted-on wings or fenders. Designed by André Lefebvré and Flaminio Bertone, the Traction featured a unibody, made using a system licensed from the American company Budd; four-wheel independent suspension with torsion bars in front; and, of course, front-wheel drive using an aluminum-cased transaxle. Citroën was one of the first manufacturers to crash-test its vehicles. It is quite amusing to learn that the Traction was tested by rolling it off a cliff. Front-wheel-drive allows the floor to be flat and the car to be low to the ground. The transaxle was strong enough that, with some adaptation, it was used in championship-winning Cooper Grand Prix cars in the ‘50s. The car you see here, a 1949 11CV Berline Légère, is owned by Citroën collector Chris Sanchez. It was imported to the Bay Area from a suburb southeast of Paris-Seine-et-Marne by a French fellow. The wonderful patina of the body is like a painting, the result of sitting in a damp old barn in San Rafael for 25-plus years. Chris’ wife has been after him to repaint it, but he is determined to keep it as is. It has an Old World elegance and clarity of line that is missing from modern offerings. Like many vintage cars, it is surprisingly small inside. The slender gearshift lever sticks out of the dash and takes a bend toward the driver’s right knee. The shift pattern is a backwards lowercase H that takes a bit of practice to master. Especially with a slightly graunchy clutch. It turns out Citroën made 4mm- and 5mm-thick clutch plates, and mixed them up within the same models. Sanchez just learned that the car got the incorrect 4mm version installed (before he got it) so a clutch swap is in its future. That aside, the car is smooth and very useable in modern traffic, and Sanchez says it will hit 75 MPH, a very respectable figure for a prewar design. Oooh la la, cest magnifique!